This symposium offers undergraduates interested in research an opportunity to present their ongoing work in a forum of their peers. Communication of novel concepts and results will help immerse the next generation of researchers in scientific discourse. The event exclusively features undergraduate researchers with interest in pursuing advanced degrees in science and medicine. Awards will be given to outstanding posters! The event is free but registration by October 1st is required! 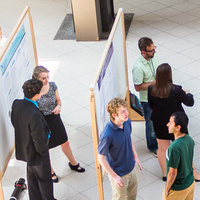 Mentors are encouraged to accompany their students, but we request that only contributing scientists attend the event and present their posters. Lunch will be provided for all registered attendees, as well as light refreshments throughout the day.